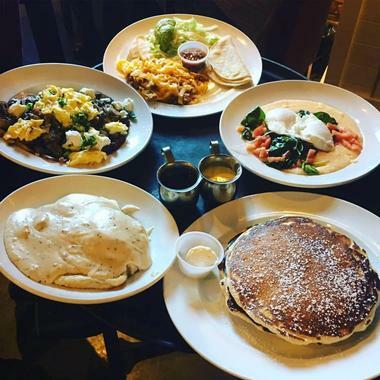 They say that the early bird always gets the worm, and Dallas doesn’t disappoint when it comes to dishing out delicious breakfasts and brunches. From bacon and eggs and stuffed French toast to chicken and waffles and deep-fried, pancake-battered turkey sausages on a stick, this city has something for every taste. And don’t forget the coffee, which ranges from house-roasted and freshly brewed espresso to frothy lattes and sweet caramel macchiatos. 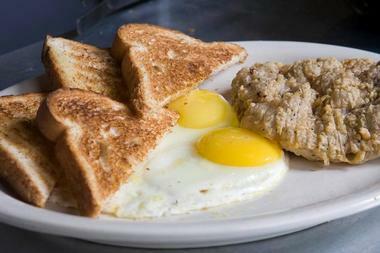 So, rise and shine and head out to some of the best breakfast joints in Dallas. BuzzBrews Kitchen is a hip coffee shop with pop art décor and a 24-hour breakfast that promises to satisfy. The tiny, intimate diner serves a creative menu of New Age and Latin-accented diner-classic breakfast fare such as egg sandwiches, a variety of pancakes, and the signature stuffed eggs with whimsical names like Californication (sautéed red bell pepper, broccoli, corn, spinach, onion, button mushrooms, and tomato), and the Hare Krishna (avocado and jack and several feta cheeses). There are also griddle cakes and pancakes, stuffed crepes, and nopales with scrambled eggs to tuck into at all hours of the day or night, along with a variety of beers and other beverages. Mercat Bistro is a contemporary European-style bistro in Uptown Dallas that serves French-inspired cuisine and wines, weekday breakfast, and laidback Saturday brunch in a classic bistro-style setting. Built to reflect European design and culinary practices, the intimate and romantic venue features beautiful décor and reclaimed antiquities and presents a tailored menu of European and Texan classics. The breakfast menu features favorites such as freshly baked flaky croissants, banana walnut bread, seasonal muffins, and artisan pastries along with classic egg dishes, vegetable quiche, ham and cheese omelets, fresh fruit, and breakfast tacos. Freshly brewed coffee and a variety of items to go are available Monday through Friday. Boasting a hip, Austin-esque vibe and still going strong after 10 years of service, Mike Snider’s AllGood Café serves breakfast and lunch to artists, art folks, and musicians on weekdays and everyone else on weekends. 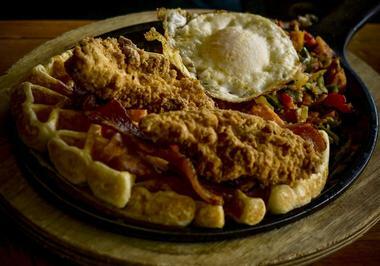 Hailed as having the best chicken-fried steak in Dallas, which is paired with green beans and mashed potatoes, the hipster café is also renowned for its South Austin Migas – eggs, cheese, green chiles, and tortilla strips, and the huevos rancheros with their sunny-side up eggs, ranchero sauce, and crispy tostada. Other delights include the fluffy pancakes and the peppered bacon as well as endless cups of freshly roasted coffee and mimosas on Saturdays and Sundays. Despite the kitsch décor of vinyl tablecloths, brass accents, and mauve tones, Benedict's Restaurant takes the cake when it comes to the food. The family-friendly diner-style eatery serves a hearty menu of breakfast dishes, including 12 omelets, three frittatas, and seven varieties of eggs Benedict, such as the decadent Rich Uncle Benedict, which is a flaky croissant topped with fluffy scrambled eggs, diced chicken, cream cheese, broccoli, mushrooms, and hollandaise sauce. For those who want more a kick in the morning, there are Cajun eggs with crawfish tails, onions, peppers, and a spicy New Orleans-inspired hollandaise. 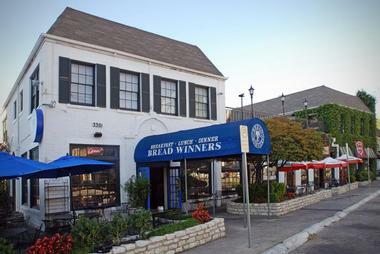 Anywhere that serves samples of its pastries before every meal is a winner, and Bread Winners Café & Bakery is just that. Packed with ardent locals sunning themselves on the outdoor patio over the weekends, but decidedly quieter during the week, when breakfast is served all day, the favorite breakfast and brunch spot boasts a relaxed coziness and a friendly staff who serve with a smile. The menu features mouthwatering delights such as egg-stuffed enchiladas with queso, pomme de terre casseroles, and no less than five flavors of French toast. Other dishes range from sweet pancakes, chicken and waffles, eggs Benedicts, homemade granola with fresh fruit and yogurt, and banana bread French toast topped with homemade whipped cream and sliced bananas, all of which can be enjoyed on the sunny patio or in the New Orleans-inspired courtyard. Nestled in the Lakewood area of Dallas, the first Café Brazil was founded as a quaint, ten-table restaurant in 1991 and has since grown to become one of Dallas top coffee shops with several locations around the city. The family-friendly (so friendly that kids eat for free) café serves delicious breakfast and specialty roasted coffees from around the world in a smoke-free, relaxing, and fun environment. The menu features everything from omelets and eggs dishes to crepes, pancakes, waffles, and French toast along with a variety of gourmet sandwiches, homemade soups, fresh salads, and signature specials such as huevos rancheros, chilaquiles, prime ribs and eggs, and fried chicken steak and eggs served with country gravy and homemade white bread. Situated next to the upscale Joule Hotel in historic Downtown Dallas, CBD Provisions is a modern brasserie that serves creative Texan comfort fare and signature cocktails in a stylish setting. Open for breakfast, lunch, and dinner every day, CBD Provisions celebrates the natural bounty and culinary traditions of Texas with a menu of contemporary cuisine prepared from locally sourced ingredients and products. A designer interior of salvaged wood floors, exposed brick walls, sumptuous leather banquettes, and an open-plan kitchen set the tone for the sumptuous fare that follows, ranging from buttermilk pancakes with blueberry butter and lemon-shortbread crumble to avocado toast on grain sourdough bread with house-made ricotta and herb salad. 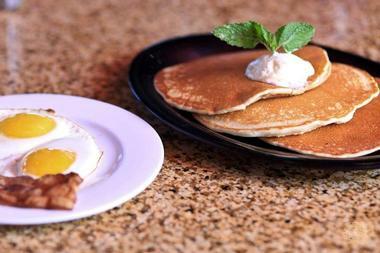 Located in the Preston Trail Village, the Crossroads Diner is headed by French-trained fine dining chef, Tom Fleming, who devotes himself to serving a mouthwatering menu of breakfast delights such as fluffy pancakes, pepper, chorizo, and goat cheese frittatas, bacon quiche, and freshly baked sticky buns that are so good they actually have their club! Open for breakfast and lunch every day, the friendly diner boasts comfortable décor and a welcoming ambiance and is a great spot for a healthy and nutritious start to the day with a plate of bacon and eggs or a quick coffee and sticky bun on the run. 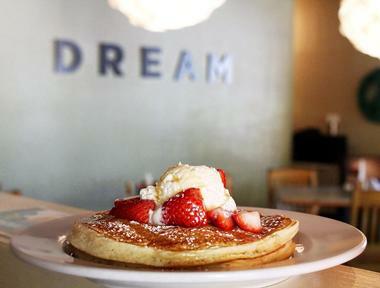 Tucked away in the back corner of the Quadrangle on Routh Street in Uptown Dallas, the Dream Café is a quietly hidden secret that locals flock to for sumptuous breakfast and lunch. One of three locations around town, this uptown gem boasts an eclectic mix of down-home and bohemian L.A. vibes with an eccentric, brightly colored interior and an all-comers menu of meat, vegetarian, and vegan dishes. Healthy options include oatmeal with bananas, currants, pecans, and brown sugar, granola with strawberries, bananas, and vanilla yogurt, avocado toast with olive oil and red chili, and Grady’s Special of smoked salmon, herb cream cheese, wilted spinach, and chopped tomatoes. 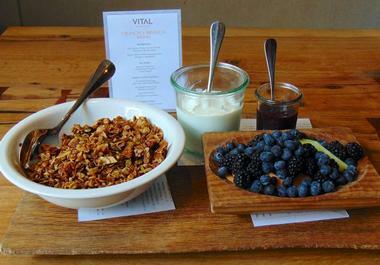 Vegan options range from meatless vegetarian sausage to scrambled tofu instead of eggs, while sweet treats include the fluffy ricotta pancakes topped with fresh strawberries, creme fraiche, and powdered sugar. Located in Mockingbird Station, Edith's French Bistro is a rustic-chic café serving freshly baked pastries and bread and French-inspired light fare and all-day breakfasts to locals and travelers alike. All-day breakfast dishes include soft scrambles, eggs on croissants, ricotta pancakes, and house omelets along with short ribs hash and raclette. A variety of crepes is a popular choice with breakfasters and includes breakfast crepes with country ham, gruyere, scrambled eggs, blueberry sausage, roasted tomato sauce; berries and chocolate crepes with dark chocolate, fresh seasonal berries, chocolate mousse, and berry coulis; and banana Foster crepes with banana flambé with brown sugar and dark rum, Nutella, and vanilla bean ice cream. 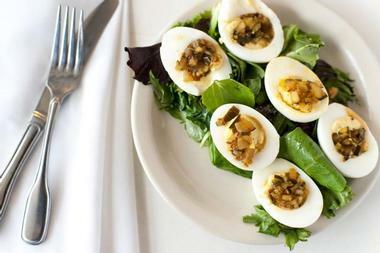 Ellen’s is a stylish Southern diner that has been serving locals with sumptuous fare for breakfast, lunch, and dinner for more than 5 years. The casual, family-friendly restaurant serves an all-day breakfast of comfort food, with signature dishes ranging from eggs Benedict served with English muffins, ham, bacon or sausage patties, and soft poached eggs to shrimp and grits served with hickory bacon, cheese grits, spicy Cajun shrimp, spinach, garlic, and tomatoes. The menu also features a variety of Mexican breakfasts (think tacos, enchiladas, and rancheros) and traditional breakfasts of pancakes, omelets, and French toast. Owned by celebrity chef, country recording artist, and best-selling cookbook author Dean Fearing, Fearing’s Restaurant focuses on presenting “no borders” cuisine with bold flavors in a lively and vibrant setting. 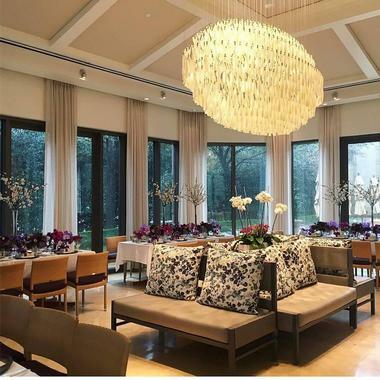 Boasting no less than seven indoor and outdoor settings, ranging from casual to elegant, including the legendary Rattlesnake Bar, the award-winning restaurant serves lunch, dinner, and a popular weekend brunch of traditional and New Age cuisine. Brunchers tuck into starters of tortilla soup, warm beignets, buttermilk biscuits and pancakes, followed by hot plates of huevos rancheros, fried chicken with whipped potatoes, blackened Gulf red snapper, and braised Rosewood Ranch short ribs. The sumptuous fare is accompanied by a range of libations and signature cocktails, such as Dean’s Bloody Mary, pomegranate mimosas, michelada gringas, and margaritas. Jen’s Place is a casual and spacious counter-service bakery and café on Alpha Road that serves freshly baked pastries, cakes, and sweet treats as well as breakfast sandwiches and wraps and other light lunch fare. 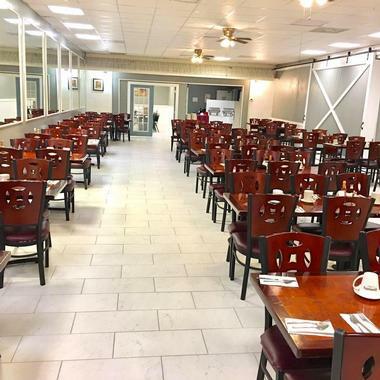 Family-owned and operated since 1995, Jen’s Place offers a warm and welcoming spot for a hearty brekkie, with dine-in or take-out menus of traditional comfort food and catering menus for special functions. 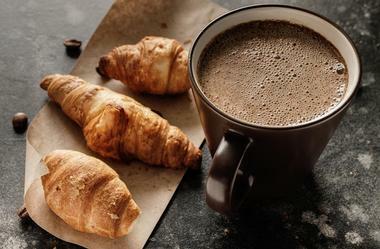 The breakfast menu features favorites such as homemade quiche, flaky croissants, muffins, scones and hot cakes, oatmeal and fresh fruit, breakfast sandwiches and tacos, and sticky cinnamon rolls, all accompanied by freshly brewed coffee to-go, imported teas, and a variety of fresh fruit juices. JJ’s Café is a casual diner-style café that serves all-American breakfast and lunch dishes in a relaxed and friendly environment. 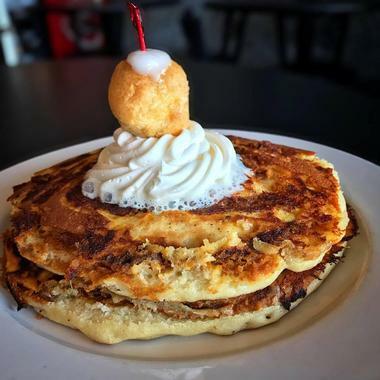 Owned by Jose Ramirez and his wife Josefina, the aptly named JJ’s Café offers a variety of traditional breakfast plates such as three-egg omelets, scrambles, eggs Benedict, and buttermilk pancakes stacked with bananas, whipped cream, Nutella, and pecan nuts. 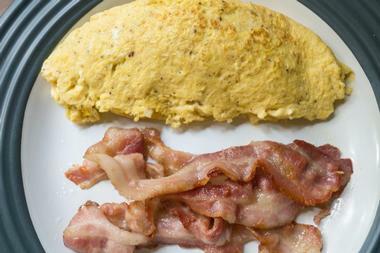 Mexican-inspired dishes include huevos rancheros, chorizo con huevos, breakfast tacos, and migas, served with scrambled eggs, Swiss cheese, jalapeño peppers, and tomatoes, and other sweet treats range from syrupy waffles and French-style crepes with various fillings to stuffed French toast and freshly baked muffins. Set in a beautiful little bungalow in the Oak Cliff neighborhood, Jonathon's Oak Cliff is a stylish and elegantly appointed café that serves a delightful breakfast in a relaxed setting. Hailed by locals as the go-to place for breakfast and weekend brunch, the charming family-run bistro is always packed with people wanting to get their taste of the café’s excellent pancakes, chicken and waffles, and eggs with two sides. Hunger busters will delight in The Nooner, which boasts a 14 ½ lb. beef patty topped with bacon, ham, Swiss and American cheese, sliced tomato, fried egg, and mayo on a toasted bun, while the bacon-stuffed and scramble egg-topped All-in-One Waffle leaves nothing to the imagination. 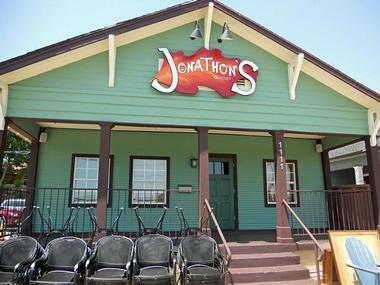 Jonathon's Oak Cliff has comfortable indoor seating and a lovely outdoor patio and deck for lazy mimosa-laden Sunday brunches. Established in Snider Plaza as a sausage-making deli in 1961, Kuby's Sausage House is a family-owned German market and restaurant serves a menu filled with German-inspired creations that highlight the fine meats from its market. Featuring long, well-worn wooden tables and a friendly community vibe, regular customers sit elbow to elbow and enjoy endless cups of coffee with their delicious fare, which includes house-smoked pork chops and eggs, potatoes or grits, or German toast battered and browned on the griddle, sprinkled with powdered sugar, and served with warm syrup. Add Oma’s potato pancakes or Kuby’s famous smoked sausages to a traditional plate of two eggs over-easy and rye toast, or try a Bavarian-style eggs Benedict dish with toasted rye bread topped with Canadian bacon, tomatoes, two sunny-side up eggs, and hollandaise sauce. Kuby's serves other mouthwatering Bavarian goodies as well, including frikadellen (a German-style hamburger), rouladen (thin cuts of beef rolled with bacon, onions, and pickles), and potato pancakes with applesauce and sour cream. Blending timeless European traditions with vibrant Latin American soul, La Duni Latin Café combines award-winning cuisine and craft cocktails with house-roasted coffee, freshly baked pastries, and decadent desserts to create the ultimate “mestizo” experience. 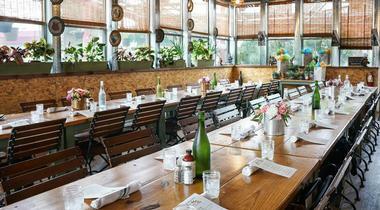 Owners Espartaco “Taco” and Dunia Borga present diners with the ultimate dilemma every morning – to go savory or sweet – with an array of mouthwatering Latin American creations from which to choose. The menu features gorgeous creations, such as cinnamon brioche French toast and flaky guava and cheese, light salsa-baked eggs, ham and Gruyere cheese scramble, or breakfast tacos packed with crispy bacon. Freshly squeezed juices and an extensive list of more than 20 caffeinated and espresso drinks, house-blend teas, and hot chocolate accompany the breakfast fare. Lucky’s Café is a retro diner with black and chrome décor on Oak Lawn Avenue that presents a famous weekend brunch of American comfort food. The spacious ‘50s-style restaurant serves a comprehensive menu of huge sandwiches, veggie tacos, and fresh salad as well as signature dishes of crispy and juicy chicken-fried steak and chicken-fried chicken and hot cornbread with sides of mashed potatoes and steamed vegetables smothered in rich cream gravy. 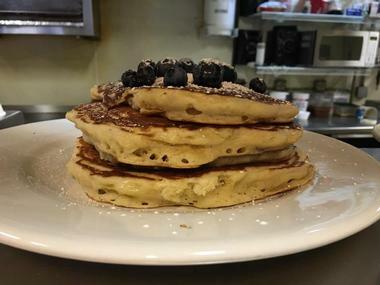 For semi-healthier options, try the gluten-free blueberry pancakes with cinnamon brown sugar butter or the banana cognac pancakes topped with roasted cognac bananas and 100% pure organic maple syrup. 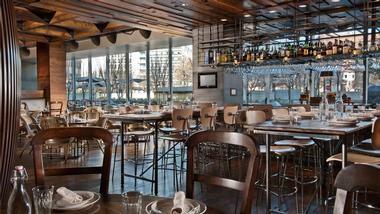 Service is friendly and quick-thinking even on Sundays, when tables and booths are packed to the brim. 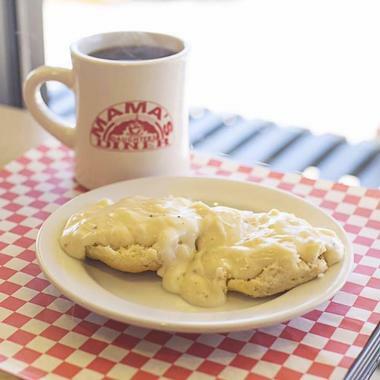 Mama's Daughter's Diner is a long-standing family-owned and operated Southern truck-stop chain that serves hearty all-American home-cooked fare for breakfast and lunch. Established over 40 years ago and boasting several locations around town, Mama’s is the place to go for made-from-scratch home-cooked favorites like meatloaf, chicken and dumplings, and chicken-fried steak served with Southern sides like turnip greens and candied yams. Also on the menu are huge sandwiches with a variety of fillings, three-egg omelets, waffles, pancakes and French toast, and Mama’s Little Extras such as homemade cinnamon rolls, biscuits and gravy, assorted bagels, fresh fruit, sliced tomatoes, and home fries. The Maple Leaf Diner is a Canadian-inspired café, bakery, and dairy bar that serves poutine and other Canadian staples in Texas-sized portions. Located in the Preston Valley Shopping Center on Preston Road, the warm and welcoming eatery offers a menu of traditional cuisine combined with creative plates such as chicken-fried steak and waffles, which includes deep-fried chicken steak served over buttermilk waffles and stacked with Canadian bacon, sauteéd peppers and onions, and cream puffs, all smothered in white gravy. Tuck into the Lox Benedict & Latkes, which features a toasted English muffin with smoked salmon, poached eggs, hollandaise sauce, and dill served with potato latkes, fresh fruit, and sour cream or applesauce. Mudhen Meat and Greens is a bright market restaurant that focuses on fresh farm-to-table cuisine with a vast assortment of healthy options prepared with fresh, locally sourced, and organic ingredients. Open for brunch and lunch throughout the week, Mudhen Meat and Greens serves a menu of fresh farm options such as collard spring rolls served with kelp noodles and creamy avocado, beet muhammara with roasted vegetables and chickpea, and pickled cauliflower. Meat options range from buffalo meatballs served with a diavolo sauce to thinly sliced beef tenderloin blanketing avocado-smeared crostini, and the food is paired with a variety of signature cocktails, craft beers, and casual wines. Norma’s Café is an old-school diner and Texas home-cooking Dallas destination with several locations around the city, the first of which was opened on Davis Street in Oak Cliff in 1956. Still serving today in a classic ‘50s diner style with vinyl booths and retro signage, the family-friendly eatery prides itself on presenting comfort food and homestyle cooking with a menu of generous, homey breakfasts and mouthwatering house-baked pies. Big eaters can tuck into hearty dishes such as rib-eye steak with eggs, multi-egg omelets with copious fillings, stacks of crisp Belgian waffles, fragrant buttermilk biscuits with sausage and gravy, and heavenly cinnamon rolls. And of course, don’t go home without tasting a slice of Norma’s homemade pie. 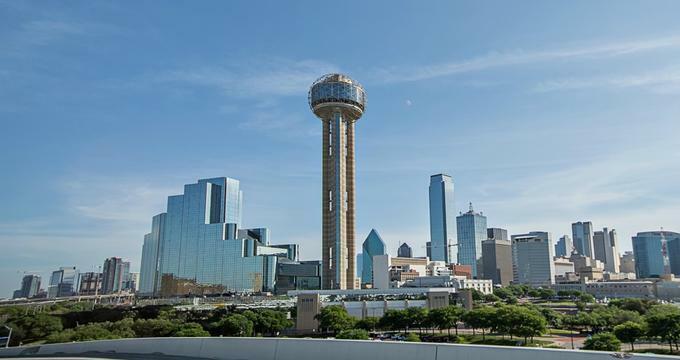 Located in the Omni Dallas Hotel on Lamar Street, Texas Spice is a stylishly appointed and beautifully decorated restaurant that serves farm-to-table regional fare for breakfast, lunch, and dinner. Designed with repurposed materials to create a casual, rustic ambiance, the restaurant boasts exposed brick walls, garage door-style doors, contemporary wood finishes, and large windows with stunning skyline views. The restaurant offers indoor and private dining as well as alfresco-style outdoor dining on the large patio against a backdrop of city views. Capturing the authentic flavor of Texas with an emphasis on fresh, locally sourced ingredients, the menu offers Southern-inspired dishes with a twist on hometown classics such as smoked salmon platters, Texas griddle cakes, eggs Benedict, and a variety of fresh and seasonal fruit plates. 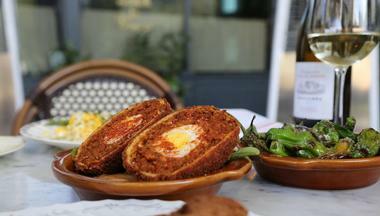 Toulouse Café & Bar is a charming French-inspired bistro run by restaurateur Alberto Lombardi that serves a menu of classic French fare with a New Age twist in an inviting and vibrant atmosphere. Boasting indoor and outdoor seating on a lovely covered patio, the Toulouse Café serves a creative menu a la Française for brunch, lunch, and dinner, with favorites such as French onion soup, croque madame, lobster bisque, homemade quiche, frog’s legs, moules, and pommes frites. 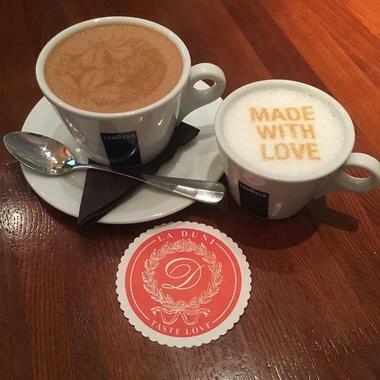 The café also offers a great spot for a good coffee and sweet pastry in true French style, with a delicious selection of sweet and savory crepes, beignets, flaky croissants, and excellent coffee. 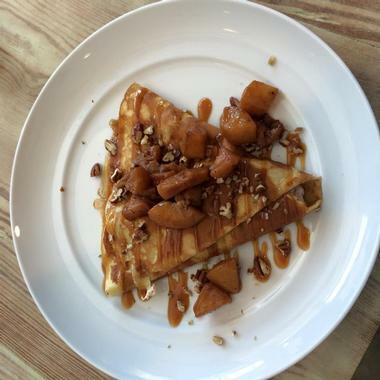 The Whisk Crêpes Café is a delightful and deliciously authentic cubby hole of a creperie in Oak Cliff's trendy new Sylvan Thirty development that has been winning the hearts of Francophiles and crepe-lovers alike with its eclectic lineup of sweet and savory crepes. The brainchild of Parisian-born Julien Eelsen, the charming spot offers a variety of delicious breakfast options from sweet crepes filled with house-made caramel, Nutella, and bananas to savory buckwheat galettes stuffed with eggs, cheese, and a choice of meat. A blackboard showcases daily specials, and it can all be washed down with freshly squeezed juice, house-roasted espresso, and homemade hot chocolate.